We understand that our customers must be able to count on us, with each and every order, to provide exactly the parts they need, without surprises. That’s why we adhere to the rigorous procedural standards defined by ISO/TS 16949:2009 standards. In addition, we are committed to providing comprehensive Production Part Approval Process (PPAP) documentation / APQP Reports / and full documentation on 8-D and 5 Factor Tree Analysis on Quality Management Controls. From the factory floor to the customer’s door, we never stop thinking about quality and our commitments and plans are robust enough to ensure your peace of mind that the “millionth” part received is just as the samples you approved. 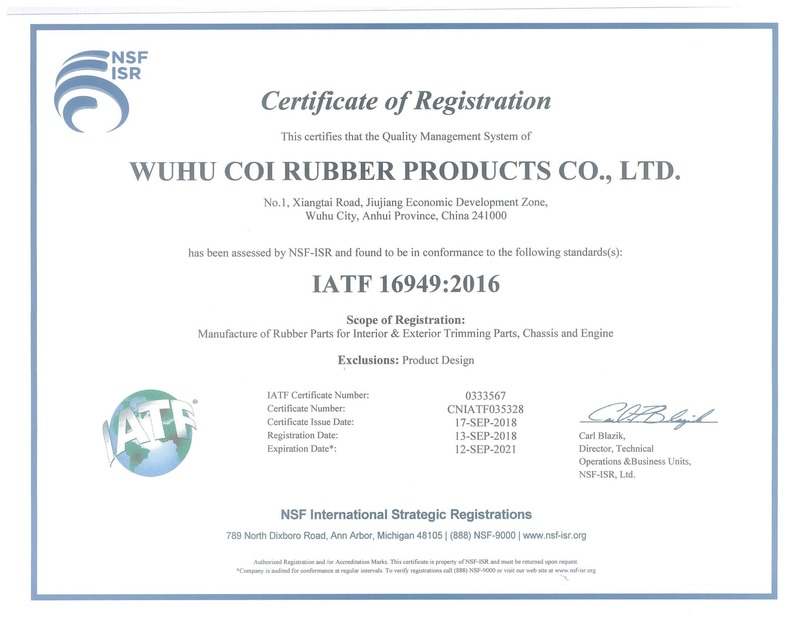 It is a prime objective of Coi Rubber to seek out continuous improvement so as to cost effectively provide our customers with products of the highest available quality. Coi Rubber’s Policy is to protect, utilize, and manage our natural resources in order to prevent pollution and to continually improve the air we breathe, the water we drink, and the earth we inhabit and also to minimize all utilities (gas, electricity, water, etc.) usage wherever technically and commercially practical. Coi Rubber is committed to environmental performance that complies consistently with current legal and other requirements.. The first phase of Advanced Product Quality Planning forces the manufacturer to take a step back before jumping into production. The key to phase one is to listen to the voice of the customer before deciding what the end product should look like. To this end, the first phase involves such techniques as market research and focus groups to determine what the customer’s wants and needs are. It is in this phase, as well, that you will produce a business plan and marketing strategy, which should all take place before your machinery even gets turned on. The point is to make sure everything is in place before you begin production, ensuring that you won’t waste valuable resources making products that won’t be successful. In addition, you’ll make sure that your production processes are sound and effective. A tool commonly used is QFD (Quality Function Deployment), review the entire quality planning process to enable the implementation of a quality program and control the inputs and outputs. While the first phase of APQP lets you produce an overview in advance, the second phase is the time to finalize the specifics of the product design. The focus in phase two is to translate the customer’s input and voice into the final schematics and features of the product. This also can involve market research and other methods of talking to customers to make sure that their needs and wants are satisfied. Ultimately, phase two involves drawing up detailed design plans. These should involve creating DFMEA’s (Design Failure Mode and Effects Analysis), FMEA’s, engineering specifications, acquiring testing equipment and planning for facility changes that might be required. APQP gets innovative in its third phase. Here, the focus is not just on the product, but the method of production. In this phase, you’ll have to draw up a plan to get production going in a way that is efficient, cost-effective, safe and successful. It involves taking the product design from phase two and developing a system to realize it. The third phase presents many challenges, especially to facilities that might be new to manufacturing. You’ll have to come up with a proposed layout of the factory floor, standards for packaging and a method for quality control and review like SPC. The process design should be flexible enough to be able to adapt to changes to the product that may occur along the way. A large part of APQP is making sure everything is functioning at an optimal level before beginning mass production. With this in mind, the fourth phase is a kind of test run to make sure both the process and product are up to standard. Usually, this involves a trial run of manufacturing and the production of a series of prototypes. This allows you and your employees to evaluate how effective both the process and product are. You should take care at this stage to get input from your employees about these matters, and to evaluate all aspects of the production process before signing off on it. One of the tools commonly used for this in the automotive industry is PPAP (Production Part Approval Process). The fourth phase of APQP bleeds into the fifth and final stage, where feedback and evaluation is formalized. At this stage, you should be getting further input from your employees to determine successes and failures. You also will need to develop corrective actions to fix any mistakes. Finally, the fifth phase offers one more opportunity to speak to the consumer and evaluate how well the final product meets his or her needs. APQP is a useful system of controls widely used in manufacturing. While it will serve different production facilities in different ways, it remains a valuable tool for ensuring that you meet the needs of your consumers with quality.